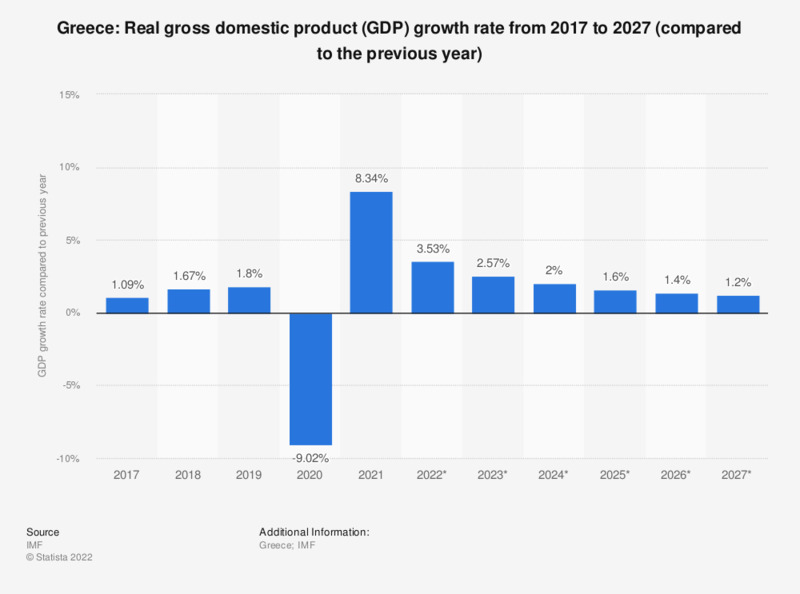 The statistic depicts Greece's gross domestic product (GDP) growth rate from 2012 to 2017, with projections up until 2022. GDP refers to the total market value of all goods and services that are produced within a country per year. It is an important indicator of the economic strength of a country. Real GDP is adjusted for price changes and is therefore regarded as a key indicator for economic growth. In 2017, Greece's real GDP increased by about 1.35 percent compared to the previous year. Greece is viewed as a high-income economy and experienced high economic and social growth and development between the 1950s and the 1970s, which was the highest rate in the world only behind Japan. However, due to the Great Recession in 2009 as well as the Greek government-debt crisis, Greek experienced severe hits to its already somewhat struggling economy. From the mid to late 2000s, national debt escalated severely but has, since 2012, remained relatively stable, primarily due to several debt restructuring deals as well as stimulus packages from countries within the EU. Different forms of financial aid were offered to Greece from countries within the European Union in order to help maintain the country from going completely dysfunctional to the point that Greece would no longer be able to pay back its debts. Greece’s economy primarily strives in the service sector and benefits exceptionally from its tourist industry. However, due to a failing tourist industry as well as struggles with properly managing imports and exports, struggles within the country are further increasing. More competent leadership, cutting costs as well as new structural reforms are necessary in order to slowly bring Greece back to an economically stable country.